Copyright © Uwe Kolitsch - This image is copyrighted. Unauthorized reproduction prohibited. 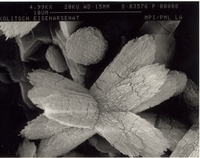 Close-up SEM micrograph of an intergrowth of bendadaite tufts (type material). 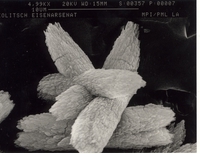 The cracks seen in the tufts are obviously caused by dehydration in the vacuum of the SEM chamber.